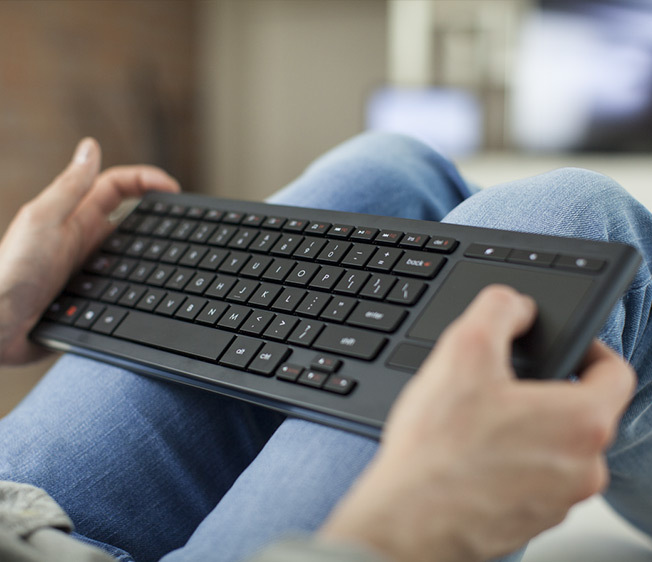 By making typing easy even in the dark, this illuminated keyboard ensures your TV entertainment is fun and hassle-free. Keys are sharp, bright and comfortable to read thanks to smart illumination. Type and the keys illuminate. Stop typing and the backlight turns off after 7 seconds to save power. A sensor detects the amount of light in the room and automatically dims or brightens the backlight. There’s a time and a place for a mouse, but it's not your knee or the arm of your couch. 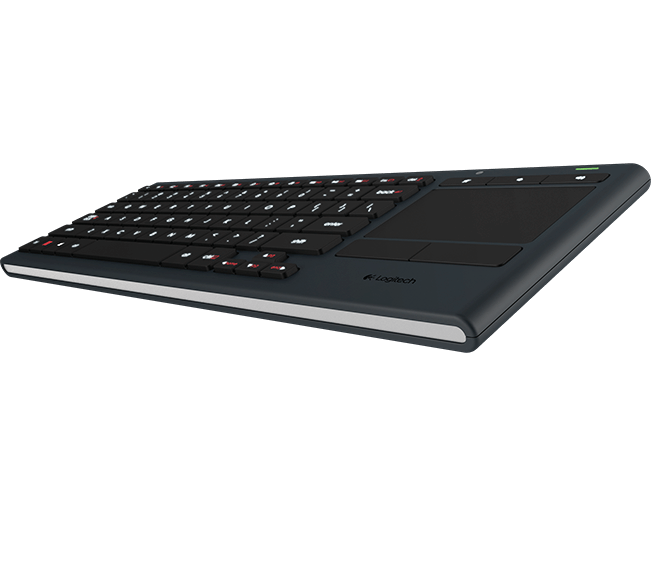 K830 makes navigation a whole lot more convenient by combining a wireless keyboard and touchpad into one device. Control the pointer precisely and accurately from a distance with the built-in multi-touch touchpad. Navigate with both hands. Point with your right hand, click with your left, using the additional left click button. You can browse from the comfort of your couch and enjoy a fast, reliable, long-range wireless connection via Logitech® Unifying or Bluetooth® Smart technology. Wireless range may vary with environmental and computing conditions. Works with Bluetooth® Smart Ready devices. 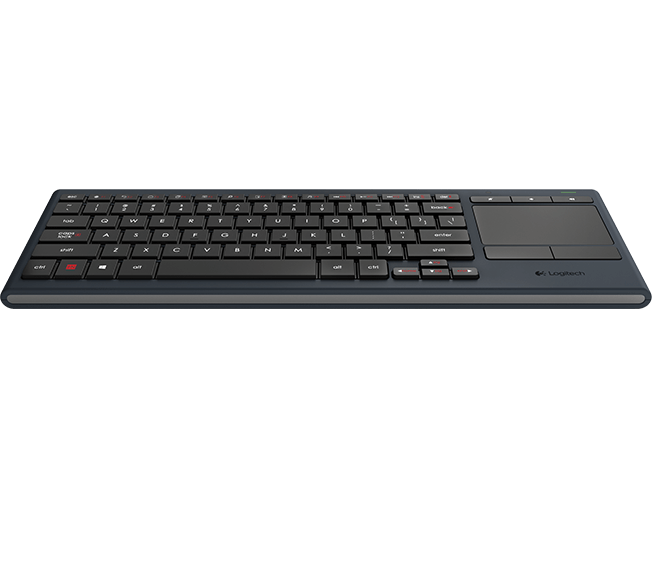 The K830 is designed to look good in your home with a combination of premium textures, metal-like finish and a unique key design in a compact, solid form. Use K830 for password entry, search queries, status updates, browsing, blogging and more. Type smoothly on soft-feel, low-profile keys. One-touch keys let you adjust the volume up or down, or mute. Shortcut keys simplify navigation with Windows or Android. Use your keyboard for 10 days after only 3 hours of charge. Charge your keyboard with the micro-USB recharge cable. Extend your use between charges with the on/off switch. Battery life was tested based on typing 2 hours per day with backlight at full brightness. Actual battery life and hours of charge will vary with use, settings and environmental conditions. The K830 comes all set to go. If you’d rather personalize the settings, you can do so using Logitech Options software.